I have recently been considering the value of messy plays. Right at the close of 2018, I posted a top ten list of my favorite theatrical experiences of the year. A friend quickly messaged to express dismay at some of my choices. In explaining them, my own reasoning was clarified: what stuck with me were formally chaotic, ‘messy’ shows which aimed at something tough and unfamiliar. Shows like The Great Leap, Usual Girls and What the Constitution Means to Me may not have found tonal cohesion, or structural perfection. Their ambition wasn’t really to check these boxes, but rather to reshape the form towards their own ends. Can we still call that “messy”? I guess I will need a new word. For want of one, though, Helen Banner’s Intelligence is certainly messy. 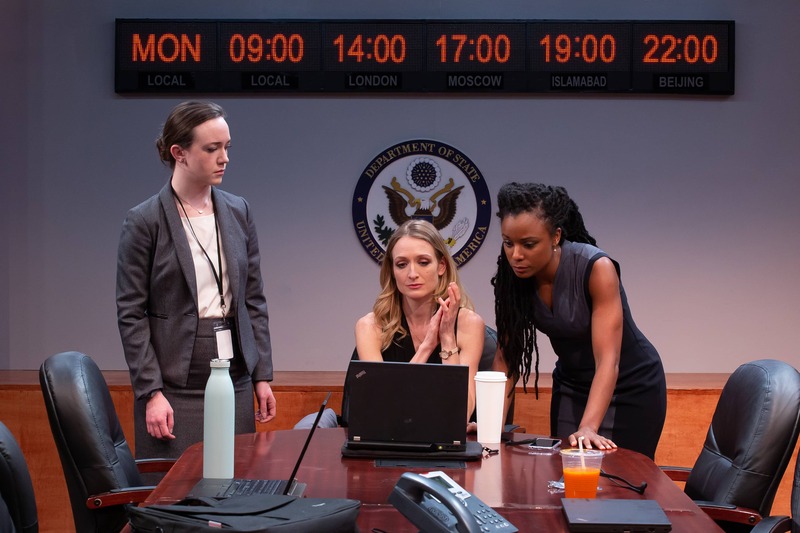 Co-conceived by Banner and Jess Chayes (who directs), Intelligence is making its world premiere as part of New York Theatre Workshop’s Next Door Series. It is an unusual play. Two ambitious Foreign Service diplomats, Lee and Paige, are assigned to a mysterious project led by Sarah MacIntyre, a fast-rising but controversial negotiator. MacIntyre has just persuaded a rebel leader in an unspecified country to make movements towards peace. As she leads the two diplomats in role-plays based around her latest negotiation, it becomes clear that MacIntyre has lingering doubts about the deal. When it goes south, MacIntyre’s position in the Foreign Services grows more fragile, and the trio’s role-plays grow more intense. In focusing on these role-playing exercises, Banner places the developing political crisis (arguably, the real drama) far outside her play’s milieu. Since that crisis is the closest thing Intelligence has to a plot, its distance from the action is initially confusing. It also feels awkward, if not distracting, that the country in question is never named. Yet Banner does have reasons for all of this. Her interest lies less in the resolution of this scenario and more in the very concept of conflict negotiation. As MacIntyre lays out her step-by-step process for managing a violent rebel’s temperament, a link is drawn (though not underlined) with women’s daily management of fragile men. Meanwhile MacIntyre chafes at her underling’s skepticism towards her methods, putting it down to women’s contempt towards other women. As these themes emerge, it becomes clearer what Banner is going for. MacIntyre has brought in these two diplomats to develop solutions for intractable global situations. Within the framing of the role-plays, Banner can look at the intractable situations women face on a more daily and mundane basis. As with MacIntyre’s recent fragile deal, the work is unstable and often fruitless; while a fast rising figure like MacIntyre faces, thanks to her gender, a harsher fall at the slightest misstep. Meanwhile Lee and Paige respect MacIntyre as a trailblazer but, ultimately, are out for themselves. The play hits on all these points and more, if in a distracted fashion. Dialogue will sound natural in one moment, and like a thesis statement the next. The role-plays start breaking in without notice – in a peculiar dramatic device that doesn’t quite work, MacIntyre has to only snap her fingers to place everyone in character. All of this structural chaos is deliberately destabilizing, suggesting the ever-shifting ground beneath these operatives’ feet. Still it took some time to embrace. The production is part of the problem. Chayes grounds us in a world that feels very much like our own, so later turns into something more surreal seem abrupt. Adding to that problem is a large digital clock on the back wall, keeping time and date clear at all points. As the characters grow more exhausted and turn on one another, that clarity feels off. Late in the play Chayes tries to adjust, shifting into an otherworldly tone to suggest the trio are losing themselves in the role-plays. It doesn’t quite work – we’re still in a drab room with stocky office chairs, whatever color the lights turn. Some other elements of the script prove iffy. The strains within the group aren’t always plausible. As the skeptic of the two, Paige feels more fully fleshed out, while Lee is defined too narrowly by ambition. The ending also proves a challenge. A final twist ties events in with our current administration, in a manner that feels tacked-on at best. It is already clear, without this turn, that what we’re seeing has relevance to the current moment. When the mess takes over, though. In knocking three smart, uncertain, complicated women against each other in a room, Banner concocts a wonderfully satisfying theatrical space. That space is unashamedly political, intellectual and female. Most exciting of all, it is unpredictable. More of that, please.